Whoa. 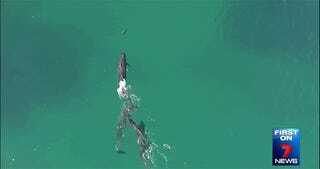 This aerial view, courtesy of a drone, captures something not often seen: a pod of false killer whales (which are a species of dolphins, of course) chasing and hunting down a shark in the waters near Sydney, Australia. You can see the gang of false killer whales basically acting like a pack of wolves on a hunt, only they’re not hunting down any old prey, they’re going after a freaking shark.